Announcement Doll leotards and clothing fit 18" tall dolls, such as American Girl and those with a similar body type.The dolly leos make wonderful little party favors .I also create one-of-a-kind cross-stitch gymnast designs. All the cross-stitch gymnast pictures are stitched by me from my own hand-drawn charts. Not computer generated patterns. I am a former gymnast and now a coach and judge. I love the sport! 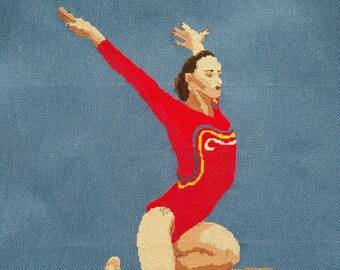 I want to share the beauty of gymnastics through my passion for needlework. Doll leotards and clothing fit 18" tall dolls, such as American Girl and those with a similar body type.The dolly leos make wonderful little party favors .I also create one-of-a-kind cross-stitch gymnast designs. Great transaction, unique fabric, thank you. This arrived days ago,and on time. Nicely made and fits my Journey Girl fine. Judging the "Olympic Show" with my Level 4 group. Combining my passion for gymnastics and needlework into an Etsy Shop! I've always loved to sew, especially clothes for dolls. My other great love is gymnastics. About 20 years ago I started to draw cross-stitch charts of my favorite gymnasts. They proved to be very popular amongst my gymnasticky friends and I sold a few to some fans in Europe. Dolls have always been my escape from the "real world". Since I was little I loved to create outfits for them from different time periods. The leotards just seemed like the perfect combo to go along with the cross-stitch gymnastics designs....and so my Etsy Shop was born!